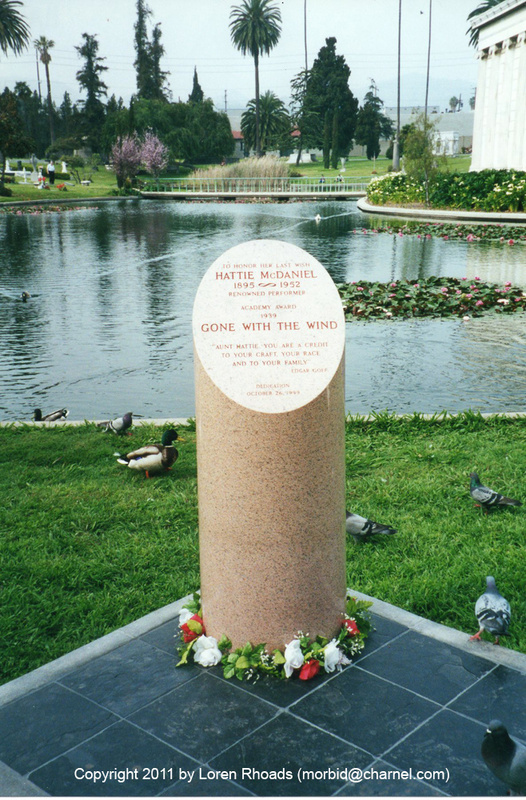 At her death in 1952, Hattie McDaniel’s last wish had been to be buried at Hollywood Memorial Cemetery. She belonged amidst the glittering stars of Hollywood, alongside Rudolph Valentino, Douglas Fairbanks, and Tyrone Power. After all, she had been the first Black woman to sing on the radio. Her career spanned over 300 movies, but she is best remembered for playing Scarlett’s Mammy in Gone with the Wind. Thanks to that role, McDaniel was the first African-American recipient of an Academy Award. She belonged among the cinematic pioneers — but was rejected because of the color of her skin. In October 1999, nearly 50 years after her death, that indignity was commemorated — if not made right — by the placement of a cenotaph to her memory in Hollywood Forever. McDaniel’s grave remains undisturbed in Rosedale Cemetery (where she broke the color barrier), but now she has a monument among the immortals, as she wished. When I visited, someone had placed a garland of bright silk flowers around the column’s foot. This entry was posted in Famous person's grave, Good cemetery news, Photo Challenges, Wish You Were Here and tagged California cemeteries, cemetery photographs, Hollywood Forever, Los Angeles cemetery, photo of the week, postaweek2011. Bookmark the permalink. As it is one of my favourite films I loved this! Thanks! She’s amazing in that movie. the place is really colorful. What a fitting photo entry and tribute. Thanks! It was the first thing that leapt to mind when I saw the photo prompt. I’m glad you like it. Thanks for giving us a bit of her history. I’m glad to see that folks are trying to rectify the oversight of a talented and gifted performer.